The Nelson twins Matthew and Gunnar brought their highly acclaimed Ricky Nelson Remembered show to Niagara Falls Thursday for an afternoon matinee. The show took place at the gorgeous Avalon Theatre inside the Fallsview Casino to a sold out audience. The show was the first of a series that will run through October 30. Touted as a multimedia show utilizing video screens that showed clips and interviews of several people who gave their take and views on Ricky Nelson, it was like seeing an episode of Behind The Music only live and in person. Coming out of the gate with the fast paced smash “Stood Up,” the band set the tone for the show. They introduced the songs and on many occasions showed clips before breaking into performing the songs. The band took time out to mention how the Nelson family is the only family to have a number one song in three subsequent generations. With that they took a quick detour from the show to play their number one hit “(Can’t Live Without Your) Love And Affection. Any Ricky Nelson related show would not be complete without what is perhaps the most important song of his catalog in “Garden Party.” The song depicts what is considered perhaps the lowest moment in his career, being booed off the stage in the world’s most famous arena, Madison Square Garden in 1971. He took that moment and persevered and turned it into what would be his final top 40 hit which hit #6 the next year. The cool aspect of the show was being able to hear some of the greatest songs ever recorded being performed live. 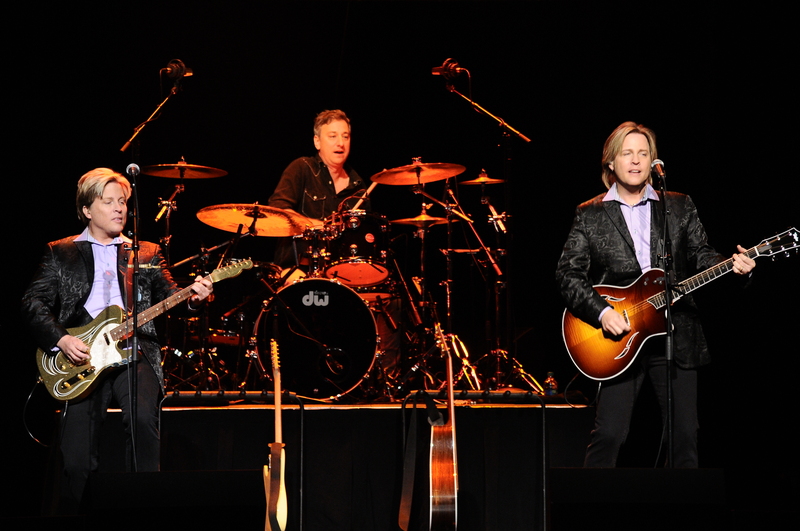 With Matthew & Gunnar bringing this show out on the road, the legacy of Ricky Nelson is able to still flourish and people can see what Ricky Nelson was all about. The show was not a tribute to Nelson but as his son Gunnar stated in a recent interview, “The show is a celebration for our dad, who was our best friend.” “Ricky Nelson has never missed a show,” Gunnar stated at the show, anyone who attended can honestly say they felt him there in spirit.